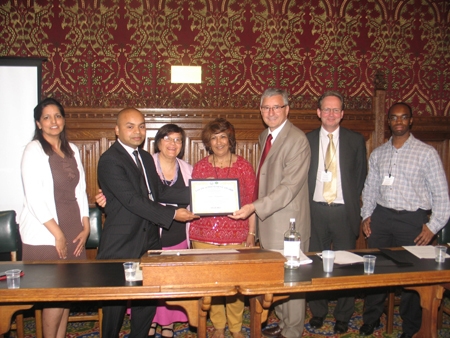 Several other MPs attended to present awards to their constituents and to offer comments to the audience of friends and family of the awardees. 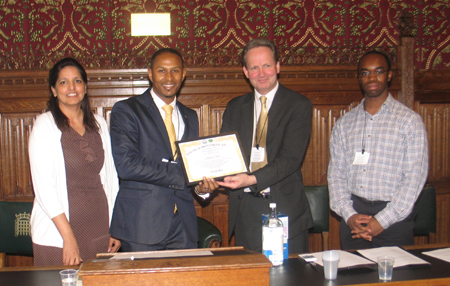 Apart from comments specifically aimed at the award winner praise was given to young people in general for voluntarism and enhancing community cohesion in huge cities like London. Jim Fitzpatrick MP said he had been an MP for 16 years and over 20 years in the Fire Service before that. He had realised the great value of volunteering in a young multi-cultural city like London. Public service allows communities to come together and improves the social value of city life. He emphasised that you get out what you put in to a big city like London. She was involved in service work during a Gap year Youth Service International community project. She explained that her 'final project during YSI was really from my heart and completely organised by me. It was about the elderly. I was working in an elderly home throughout the year and in a school helping in art classes. We all had to create our own project and I wanted to connect the elderly with young people because in the elderly home there are so many old people just waiting to die, some without any family visiting regularly. I organised a photography project for university students. Over three weeks, the students met with the elderly and talked. The students had to present three photographs and a written piece. We had an exhibition at the elderly home. Then the winner won £500 and had their photographs in a photography magazine. We had several speakers. One of them was a famous photographer. I did a presentation on statistics about the elderly and why it's important. I had to apply for funding for the project. Nathaniel is a social entrepreneur whom seeks to empower and help young people rise above the social limitations. In 2007 he founded The Safety Box which sought to use an adapted model of the national curriculum interrupt violent behaviour and foster achievement through schools in the UK. The work to date has seen over 5000 young people impacted and has assisted a number of youth at risk to get a better start in life. His new company Gennex aims to create a disruptive social impact in the lives of people that face the challenges of no electricity, poverty and lack of education. His aim is to light up lives with the use of solar power and bring change. On a mission to inspire the next generation and create a platform for enterprise and entrepreneurship with the use of solar, training programmes are being set up in Kenya / Malawi and Jamaica. Equipping both youth and women with skill sets and also some of the Gennex solar products enabling them make extra revenue by either setting up charging stations or selling/renting the solar products to others. All the skills taught are transferable and any business can be grown from the training programs provided. Focusing training around renewable energy provides the information and understanding that it isn’t a costly, unreliable alternative source of energy but instead a clean, efficient source of energy that can be created anywhere with the right materials. A “Do it Yourself” solar kit which teaches how to make a small solar panel also accompany materials for the training program. He is trying to create a social change by giving people power and also the ability to make money thus helping youth to rise above poverty. 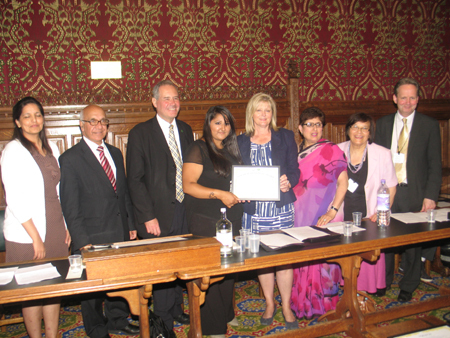 Anne Main MP and Bob Blackman MP came to present the Youth Achievement Award to Tejal Patel. Ms Main congratulated her constituent for her great work, passion and commitment. Mr Blackman added that he knows the Sai School of Harrow very well as a wonderful component of Harrow that he would like to support to become an Academy. Tejal Patel was nominated by Ranu Mehta-Radia, Founder and Chair of the Sai School of Harrow where she is the Youth Coordinator. 'As Chair of Sai School, I would like to nominate Tejal Patel, an ex- pupil of our Saturday School who started at our free Saturday School at the age of 5 years, she then graduated into our Youth Wing at the age of 16, and was voted as our Youth Coordinator due to her popularity amongst the youths. Due to her commitment and passion in promoting the Multi faith and citizenship activities of our unique Saturday School, she is currently shadowing the two Head Teachers, helping with all administration tasks, at the same time efficiently running the Youth Wing and bringing in new initiatives to Sai School, engaging with partner organisations for the benefit of the community. Tejal now hosts our website and Facebook group, she is the contact person for the School, liaises with all new parents, organises Open Days, runs the Youth Wing ensuring that all youths are involved in some activity, has devised all our Health and Safety Policies. Ranu Mehta-Radia, Founder and Chair, Sai School of Harrow. Saidi Kawooya is 23 years old and a young entrepreneur who started a bank club through which he helps young people with entrepreneurial skills to build their own independence. He has started a business with his partner Junior Drogba called Youth Empowerment Academy. His company helps young people/high risk offenders get back into work and the education and working environment. They do this by delivering long term projects with different corporate organisations and the government. Last year they teamed up with the Metropolitan Police to deliver a project where ex offenders and the police came together. They did this by arranging a football match where 15 ex offenders played 15 police officers in an 11 aside football match but with the main focus to get them back into work and education and also the staff at YEA mentor the young people, below is an article of the event and a picture with Saidi and the MET commissioner. They are also dedicating some of their time in helping youth clubs. I am 17 years old and was born in Albania. Being the youngest of four children, I was extremely spoilt, not just by my parents, but by my siblings also. I got what I wanted, whenever I wanted it. “No” was not a word I heard often. Coming to England changed that; it was a strange new place, which a different language, and my family were no longer able to give me everything I wanted, but they gave me all of their time, and that’s all a child really wants and needs. I remember when I was five, seeing the adverts about poverty in Africa for the first time, and I had a dream of rebuilding the whole world so that those children had the same opportunities we have. I didn’t really know how big a task my dream would be, but my mum taught me to always follow my dreams. I’d always try and help others as much as I could by doing things such as ‘Reading Partners’ (where I’m allocated a year 7 student who has problems with reading and I help them become more confident and comfortable while reading). This year I started my A-Levels, picking Mathematics, biology, chemistry and physics, and I would really like to study Medicine if I can. However, for the first time, I received an opportunity to help people in the place that first inspired me; Africa. The Cardinal Wiseman Malawi Trust is a charity run by my school, and each year 6th form students are interviewed and chosen to form the Malawi team. I applied, and thankfully got in. As a team, we work tirelessly to raise money for the three schools and health clinic we support in Malawi. We also do individual fund raising. I chose to cut off all of my hair, which got a lot of attention from the local newspapers, and I also get asked by children in the street if I’m a boy or a girl, which never fails to make me laugh. There are some days where we have an event and I’m working until late hours in the night, but it’s all worth it. Every penny counts, and I’m lucky to have the full support of my family helping me fundraise while doing my A-levels, which is a lot harder than it may sound. The children in Malawi are so appreciative of everything, with brightly shining eyes, eager to learn and receive help. As soon as the truck pulls up near one of the schools you can see large groups of children who sing you a welcome song. It is beautiful. It is also in stark contrast to the situation of youth in this country. My mother is a foster carer and, over the past year and a half, we have had many different children living with us. Each of them had their own story which had shaped them into a unique person. The lack of love and care some of these children had received from their families showed in the way they acted and how surprised they were when they entered our home. Before, I didn’t know anything other than the love and warmth I had received from my family, and was shocked to learn of the different stories, and see the effect it had had on the youngsters. WE all try to help with the fostering, and my family treats every one of these children as if they were part of us. Every day is a challenge, and it teaches me more about life and the world we live in. We try and teach them values and skills which they can take onboard and use in later life. We work together with people of different ethnicities, religions, and beliefs, we don’t tolerate them – because toleration is ignoring the bad – we work with them, and they work with us. I’ve made some great friends through fostering, and am so happy to see the positive impact we have on everyone who lives with us. My mother always encouraged me to save money, and spend it only on things I needed. She also taught that charity starts at home, and it’s true, we should focus on the future of today’s youth, because today’s youth is tomorrow’s future, and if we give them our time, love and attention from a young age, our future will be bright." Since I was 15, I have been determined to do all I can to work towards ending poverty worldwide and particularly in Africa. I have since then fundraised for charities including Oxfam and the Make Poverty History campaign. At 18 I studied a Third World Politics degree to enhance my knowledge in the field so close to my heart and during my time at University, I also set up a charity fundraising society 'watoto wa kenya' and supported three needy projects in Kenya, a school and two community projects. After graduating University, I travelled to Kenya for my second time and worked with local grassroots projects helping street children and vulnerable groups. I returned to the UK and began laying the foundations to begin to set up a charity dedicated to combating poverty overseas. I worked for a year with a community organisation in Winson Green to provide help and support to disadvantaged communities including the unemployed and refugees. Now I currently work with people with learning disabilities, by empowering people and providing them and their staff with support. So far I have managed to support three projects in Kenya with key funds to support their existing work, provided resources and a platform here in the Uk to link them with sustainable forms of support. Aya Faisal, who is from Egypt, joined the ‘Association for the Development and Enhancement of Women (ADEW), an NGO that helps marginalized women in squatter areas in Cairo, Egypt which she joined on 2010. She believes in "Helping women to help themselves". The first project that she worked on was "Active Citizens" (AC). Aya received training and supervised the delivering of ‘Active Citizens’ workshops. 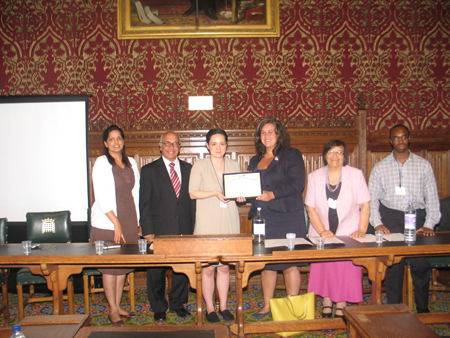 She explained that, ‘On March 2012, the Spring Board programme was introduced by the British Council. The main objective of the project is to provide women with the tools and skills to develop themselves. There is no age limit to join Spring Board; only to be a woman from an impoverished area. Before delivering the workshop I received a master training from Spring Board Consultancy. Afterwards, ADEW’s team announced that the programme will take place once a week over the course of a month. The first day is usually an introduction to the programme and also an introduction to themselves. Yes, I mean each one of the young women will get to know herself. The programme includes four main topics: explore yourself, gain self confidence, overcome challenges and make decisions & take real action forward. Each time we had a guest speaker, a woman who has made a difference and faced social/economic/cultural challenges. The main message that I was trying to send it to them is that ‘you can make a change and be the change that you want to see’. Together, we shared our experiences. I learnt a lot from them! Despite the instability and insecurity in Cairo at that time (November and December 2012) participants didn’t miss the workshop and were eager to learn. I delivered this programme to two groups for a total of 30 participants from different backgrounds and areas in Cairo. Girls were inspired by this programme and made important decisions to become who they want to be. Iveta Koutna is a young graduate in International Relations. In 2011/2012 she worked at the Embassy of the Czech Republic in Egypt. During her work placement, she organized variety of fundraising events for charities. She also supported and helped Katarina Azab, a mother, whose son was kidnapped in Egypt and whose Embassy did not take necessary measures to help her. Children's Education Fund for Africa (CEFFA) is UK charitable organization, which funds and promotes education in Africa. The main aim of our charity is to directly pay educational scholarships for disadvantaged children and orphans up to secondary school in some of the poorest areas in Africa. Firstly we focus on slum and rural areas. We have selected partner schools in Douala (Cameroon), with which we cooperate. We know that funding school fees is not enough. Tuition fees are not free in many schools in Africa and poor families are already struggling to afford sending their children to school let alone all the school material that we know is very essential to every student that’s why we are also committed to supply student with most school materials. Our long-term goal is also to create after-school activities for children in slum and rural areas. In the afternoon classes children can learn extra skills, which contribute to the personal growth and, which gives them better employ-ability potential. Furthermore we would also like to improve school facilities and support establishing of schools in poor slum and rural areas. Investment in education benefits not only the children, but also the society, and the world as a whole. We believe that enabling every child to have an access to education contributes to breaking the long-term cycle of poverty. Any help and effort can make a difference. Arnaud is young Christian youth worker who was once a key member of the mentoring and leadership programmes at Harmony Christian centre. He has worked with different councils youth offending services and currently works with Dagenham and Barking probation services. Arnaud's passion has always been to change lives for the better. He founded a charitable organisation called Settledlife (www.settledlife.co.uk) to help emotionally vulnerable and socially excluded young people. Arnaud runs sports sessions for young people as well as organising bible study and discussion/ mentoring for young people. Arnaud has also worked with the league100 organisation (www.league100.com) on a voluntary basis running leadership projects, conflict resolution workshops and sports tournaments. As a younger child I gained a big interest in social and political issues throughout the world, watching the news as a child enticed me into issues such as world hunger, women’s rights , education etc.. Stories of my father’s childhood and how my family are currently living in Morocco is a major reason why I am very interested in politics within the Arab world. Four years ago I met Fatima through my mother and became interested in her work spreading the awareness of literacy by creating libraries and donating books. ‘Giving Chances’ is a very small charity I began to support her through fundraising events and with ideas on how to raise money and spread awareness. Last year I got to go to Morocco and went to my families hometown. Throughout that time I led numerous activates for children including arts and crafts, sports and music. I especially enjoyed this as it allowed me to encourage the importance of education and boost morale among the poorest of the children. I know from experience that education isn't a priority within those young minds. I can honestly say that my trip to Morocco was the best experience of my life. I hope to continue with the amazing work ‘Giving Chances’ does in future. I hope to try and tackle the issues of poverty and lack of women's rights within Morocco and other countries.